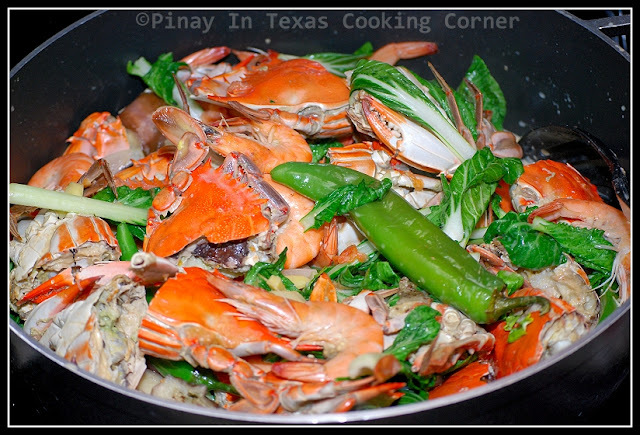 Ginataang Alimasag at Hipon (Blue Crabs and Shrimps in Coconut Milk) is my favorite way of cooking crabs and shrimps together. 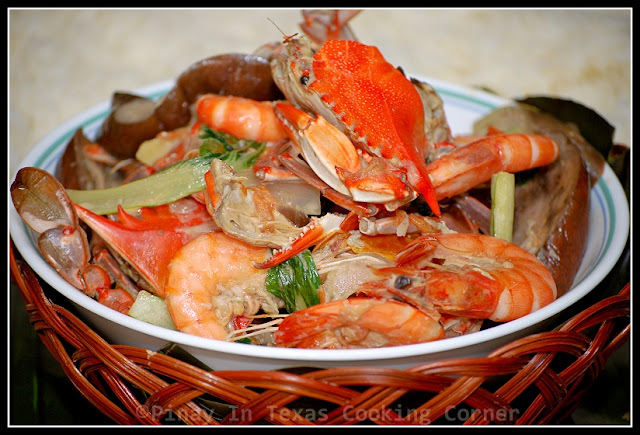 It is so easy to cook but produces a very flavorful seafood dish. 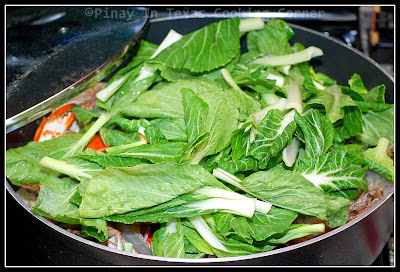 I love it with lots of spinach or Bok Choi plus eggplant and pepper. 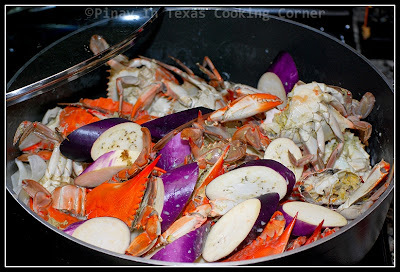 It's always so irresistible for me to cook this whenever I find blue crabs at the Asian Store. 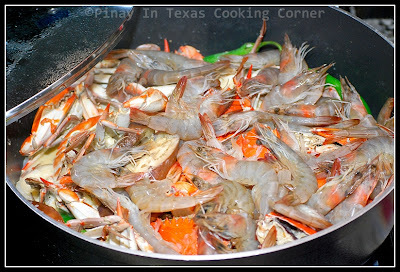 I included this dish in my proposed entrees for my Foodbuzz 24x24 Kamayan Dinner...and I'm telling you, it was a hit! 1. 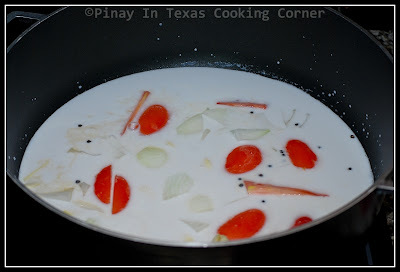 Pour coconut cream, water, fish sauce and vinegar in a large sauce pan. Add tomatoes, ginger, garlic, onion and peppercorns. Over medium low heat, bring to a boil and let simmer for 10 minutes or until tomatoes are soft. 2. Add crabs, eggplants and anaheim peppers. Simmer until eggplant is almost tender. 3. 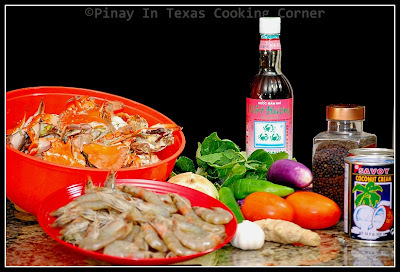 Add shrimp and pechay. Simmer just until the shrimps turn pink. 4. Add salt to suit your taste. Simmer for another minute. 5. Remove from heat. Serve hot with rice! Seafood in coconut milk?? I'd bet it was a hit with FoodBuzz! It is with me too! Amazing flavours (and colours) Tina! Have a great Sunday! What a great dish! I have never cooked crab yet. I love the coconut milk flavor.... looks soo good!!! Makes a big difference when you put coconut milk (gata)on seafood! Fish sauce on the side and with all the aligue mixed with my rice? No talking please, this crabs need my undivided attention! Oh boy Tina! you got me very very hungry out here :) It looks just so delicious. pies: I just love reading your recipes and feasting with your photos!